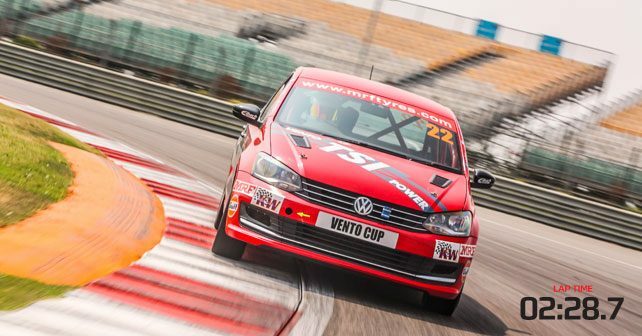 Why is the VW Vento Cup car here, you ask? Well, if we’re honest, for no reason other than the fact that we wanted to drive it around the BIC once again. But if we had to come up with a legitimate sounding reason, it would be this – you see, at its heart, the Vento Cup car is a stripped out production car. This, effectively, is what your regular street car could become if you gutted it, added a roll cage for safety and rigidity, a more powerful motor from within the VW family, a set of racing slicks from MRF for leech-like grip, and suspension and brakes from some specialists manufacturers. What you’re left with then is the most fun car of the lot – perhaps even including the R8 and the Lambo. You see, in exotics like those you have to worry about putting too many miles on the clock, or wearing out very expensive brakes and tyres, whereas in the VW Vento Cup car you can simply pound around the track at ten-tenths all day long and not have to worry about anything at all – with the exception, perhaps, of filling it up with premium fuel every once in a while. With a lap time of 2:28.7, the Vento Cup car proves that these tweaks really do result in a very serious performance machine indeed. Despite being a few hundred horsepower less than the Mustang, the Vento Cup car comes very close to the thundering American’s time. In fact, the tyres on this racer were decidedly second hand – since they had just finished a weekend of racing (the rears, especially, were quite worn). We reckon that, with a new set of slicks, this VW would probably surpass the ‘Stang. What’s even better is that it manages to be an incredibly easy car to drive, while providing a very pure driving experience. It’s intense yes, but once you’ve warmed up the tyres its very easy to push to the limit. In fact, our firm belief is that everyone’s driving test should include driving a race car on a circuit. It’ll actually reduce bad behaviour on the road and make people better drivers once they realise just what a science going fast in a car or on a bike really is. We bow to this factory racer, and thank VW for dramatically elevating the standards of racing in the country.